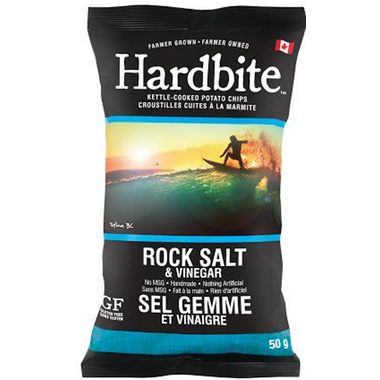 Because they love a challenge, Hardbite's Rock Salt & Vinegar chips are the quintessential blend of savory and sour with a splash of living on the edge. These chips are from homegrown hearty potatoes, selected to be the critical first step in developing this legendary-tasting chip, described simply as mouthwatering. 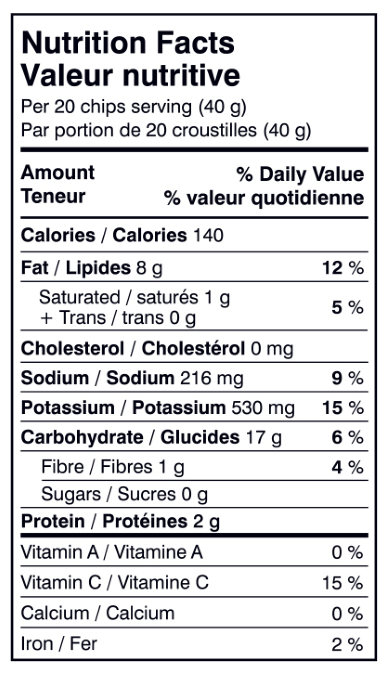 Ingredients: Potatoes, non-hydrogenated sunflower oil and/or non-hydrogenated canola oil, tapioca maltodextrin, rock salt, vinegar powder, evaporated cane sugar, malic acid, citric acid. These have become my favourite Salt and Vinegar Chips. I love them! These are my favourite chips ever! Good, but needs more vinegar. This is more like a "regular" flavour than it is salt and vinegar. The texture is very good but the vinegar flavour is negligible. I ordered two bags, one for myself and one for a friend, and we concurred that these chips do not have much of a vinegar flavor. They're not a bad chip, but if you're looking for a flavor profile that's heavier on the vinegar edge than you would do well to look for another brand. As a regular salted chip, these were tasty.